The Headteacher belongs to the Bishops Stortford Head Teachers Leadership Consortium which provides local support across a wide range of subjects. The S.C.E.M.A. Network offers the opportunity to work with all the 23 schools in the Bishops Stortford Network. This is both at pupil and staff level and led by our school. Through its work with the original STAGE Network, Little Hadham was invited to become a strategic partner for the Bishops Stortford Teaching Alliance (Catalyst). The Headteacher sits on the Alliance Leadership Executive Committee. She is also a Catalyst Outreach Professional (C.O.P.) for school to school support work. The Deputy Head runs the Catalyst Literacy Network Group and our Forest Schools Leader runs the Catalyst Forest Schools Network Group, which both meet half termly to work collaboratively on Literacy/Forest projects. Through Catalyst, the school recently led a Modern Foreign Languages Pilot Project for the sustainability of French teaching in local primary schools and was also involved in the SEN project for establishing a Diagnostic Testing Library for local provision. We have recently worked on a variety of different projects, such as Latin, Reading and Problem Solving in Maths with Herts and Essex High School. Little Hadham Primary School is a Partnership School with Hockerill Anglo-European School for both Modern Foreign Language development as well as offering Community placements to Year 12 students. Little Hadham Primary School is also a Partnership School with The Bishops Stortford High School. To further develop P.E in our school, we belong to the Bishops Stortford Sports Partnership, based at Birchwood School. Slightly further afield, the school has developed a link with a highly contrasting primary school in Watford, called Cherry Tree Primary School. 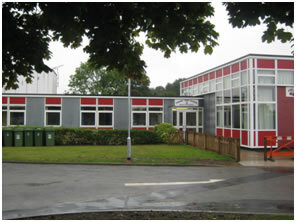 It is a two form entry with eight brand new classrooms. Our School Councils link and share ideas. At Cherry Tree, over 38 different languages are used across the school, which represents their diversity.